SustainableWork: "Collaborative frame of mind: Rural Development state directors discuss potential food initiatives. Local processors help rural economies." "Collaborative frame of mind: Rural Development state directors discuss potential food initiatives. Local processors help rural economies." The Country Today is a great source of independent news about rural life and agricultural based enterprise in the Upper Midwest of the US. "MINERAL POINT - Rick Terrien believes there are no limits to food collaboration possibilities in the Upper Midwest and beyond." "Terrien, executive director of the Iowa County Area Economic Development Corporation, organized a meeting June 22 with U.S. Department of Agriculture Rural Development state directors from Wisconsin, Illinois and Iowa to talk about how the three states and Minnesota could work together on food projects to help revitalize rural economies. 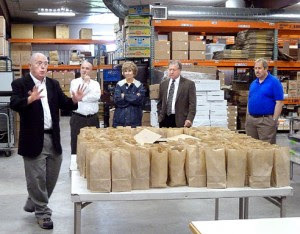 The meeting was at the Innovation Kitchen, a community-access food-processing facility in Mineral Point." "Stan Gruszynski, Wisconsin Rural Development director, said food projects such as the Innovation Kitchen could 'bring back some economic vitality' to rural communities"
"These are the sorts of things we might think about, having the contiguous states join together to make local food production, processing and marketing a bigger part of the economy of our region, Gruszynski said." "Colleen Callahan, Illinois Rural Development director, said since there is limited government funding to support projects like the Innovation Kitchen, collaboration makes a lot of sense." "She supported the idea of a trade association between Wisconsin, Illinois, Iowa and Minnesota to work on joint food projects." "We hope to replicate in Illinois what you're successfully doing here in Wisconsin." (Terrien) "There's no reason this can't be duplicated anywhere in the US." "In terms of rural economic development this was a major honor for Iowa County and our region." Download PDF of this article. Permission provided by The Country Today. Thank You! The Country Today article. Paid access past intro. Photo courtesy of The Country Today. Thanks! Iowa County Area Economic Development Corp.